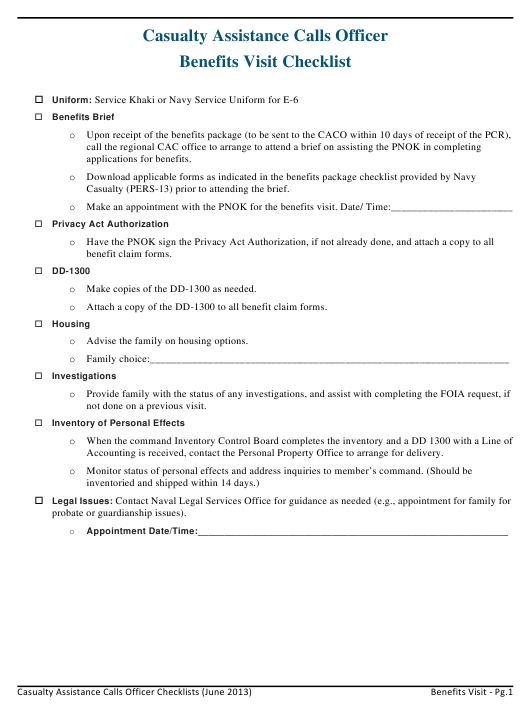 This "Benefits Visit Checklist - Casualty Assistance Calls Officer" is a document issued by the U.S. Department of the Navy specifically for United States residents with its latest version released on July 1, 2013. Download the up-to-date fillable PDF by clicking the link below or find it on the forms website of the U.S. Department of the Navy. o Keep copies of all claims submitted. Copy for your case file. o Fax a copy of all completed application forms to the regional CAC office. Submit “final” NAVPERS 1770/7 when all benefits/monies have been received. number to the regional CAC office.